Home/Restaurant Customer Experience/Reputation Management/Is it Necessary to Respond to Positive Online Reviews? Restaurant reviews are easy to come by these days – diners, whether delighted or disturbed, are willing to give their unsolicited opinions on public forums. There are plenty of platforms to post an evaluation on, like TripAdvisor, Yelp, and Google, just to name a few. As a business owner, it’s wise to keep tabs on what people are saying about your restaurant in order to maintain an impressive reputation online. I’ve already discussed the importance of responding to negative reviews in an earlier article, but is it necessary to respond to positive online reviews as well? Below, I discuss the etiquette and best practices for responding to positive online reviews about your restaurant. The answer is simple, yes, you should be responding to positive online reviews just as often as negative ones. Of course, it can be argued that addressing negative feedback should take top priority because a scathing summation of a customer’s experience can cost you business. But, positive reviews are just as important to your online and in-house reputation. A satisfied customer took time out of their day to praise your restaurant and detail the experience they had dining with you. They didn’t have to recount their positive experience with readers, but they did. The least you can do as the restaurant owner is to acknowledge your appreciation of their kind response. You can keep your reply simple, thanking the customer for their words and hoping that they’ll join you again. Showing that you appreciate the effort a customer put into writing a positive review makes your restaurant seem more human. It can also help establish long-standing relationships with customers and inspire loyalty. Leaving a positive review isn’t the only kind of a customer to do, it’s free, favorable advertising for your business. According to BrightLocal research, 60% of people read online reviews for a local restaurant or cafe. Further, 73% of consumers trust a local business more after reading positive reviews. Positive reviews clearly matter to hungry diners thinking about visiting your restaurant. When people see a large number of high-star reviews for your restaurant, they’re more likely to dine with you. Personally, when I’m looking for a place to eat, I take into account the number of positive reviews. The more negative reviews I see, the less chance there is that I’ll dine there. 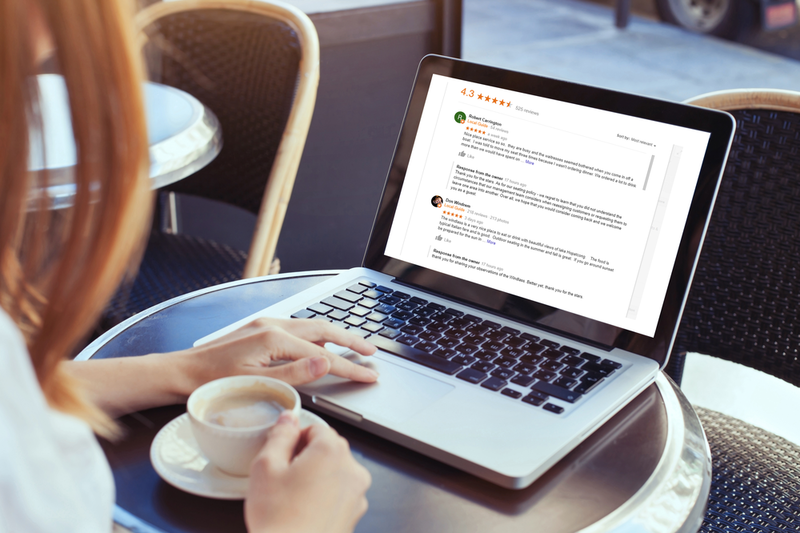 If people are reading your restaurant reviews, which they will (consumers read an average of 7 reviews before trusting a business), they’ll notice that you’re putting the effort into responding to them. Again, this further establishes a personality for your brand and shows that you care about customer service. You know you need to respond to positive reviews of your restaurant, but how should you begin? Of course, you’re busy and can’t dedicate hours per day just responding to criticism and praise on different review sites. But, you still want to maintain a presence and rapport with your customer base. We’ll outline how you can achieve it. Come up with a generic response that you or your staff members can use when replying to an online review. It will help to set the voice and tone you want to convey for your business. However, providing canned responses for every review won’t look good on your part. Of course, you’ll want to tailor each reply, but having a solid example response is a reference point. It ensures that whoever is handling review responses has a starting point they can refer to and utilize along the way. Most times, you’ll be able to see the name of the person who left the review. Use it! Personalization goes a long way. A simple “Hello Mary” or “Hi Peter” can help build the connection between you and your customer. Again, it establishes that human voice behind your brand and shows that you care about your customers’ opinions. You can even sign off using your name to end the response. If you’re the owner of the restaurant, or even another employee, use your name when wrapping up your reply. This further shows that the response was made by a real person and not just an automated system. Going the extra mile to mention a highlight not only makes the interaction more conversational, it shows that you read the review and that you, again, appreciate it. A restaurant business is hectic, unpredictable, and fast-paced. At times you probably feel like you don’t have time to breathe, let alone time to respond to reviews online. But, it’s essential, and designating some time to the task will help you stay on track. Create a weekly calendar block when you know your schedule isn’t as busy and use that time to responding to feedback. Things may come up and priorities will shift, but you’ll at least have a helpful weekly reminder to check in on your online reviews. Making review response part of your routine ensures you will keep it top of mind. Reviews can be found on an array of websites and apps. It can be time-consuming to have to keep up with every review on each platform. Here at SinglePlatform, we strive to make your life as a restaurant owner easier. That’s why we created our Review Intelligence and Review Monitoring tools. With these tools, we aggregate all of your online reviews from the essential sites into one easy-to-use platform. From there, you can drill down on reviews by star ratings for different categories. Quickly identify what makes your business stand out from the crowd and what areas you need to make improvements in. It’s review reviewing made easy with SinglePlatform! Responding to positive reviews is just as crucial as addressing negative comments about your restaurant. Providing a personalized, well-executed response will help to establish a synergy of sorts between your business and your customers. Utilize these tips to become a master at review responses to lift your restaurant up to the next level of customer interaction and care.